St Olaf Church is situated in Wasdale Head, a tiny hamlet at the northern end of Wastwater in The Lake District. A wild and remote place, it is surrounded by hills and mountains including Scafell Pike, the highest mountain in England. 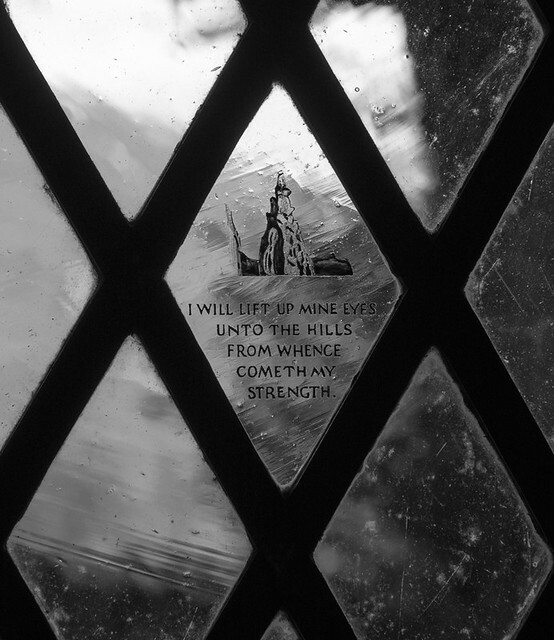 In one of the leaded light windows of the Church there is an inscription and etching of Napes Needle on Great Gable. The words are from the first verse of Psalm 121, and for various reasons this Psalm holds a special place in my heart. I first visited Wasdale Head and this Church thirty years ago. It was on the occasion of our first family holiday following the death of my father from Motor Neurone Disease in 1983. Twenty two years ago I returned with my future wife. It was during our stay in The Lake District that I proposed and we married a year later. Again we made a point of visiting this Church and we bought a postcard of the window and the inscription. To this day this postcard still hangs on the wall of our cloakroom with other mementos of our visit. Just three years ago my mother passed away and I read Psalm 121 at her funeral service. Today we celebrated and gave thanks for the life of my sister who died at the end of March from cancer. She was just 59 years of age. Again I read Psalm 121. I know this particular post is very personal and poignant and arguably has little to do with photography. To the contrary, my visit to the Lake District thirty years ago, inspired me and instilled in me a love of the countryside and the great outdoors – wild places, where the ever changing light offers so much drama and splendour. This entry would not be complete without including the full text of Psalm 121 – A Song of Ascents. This is the Revised Standard version and so some of the words used do vary from the inscription. ‘I will lift up mine eyes unto the hills’ and try and and do justice through my photography to the beauty that surrounds us.